Too noisy, too slow. 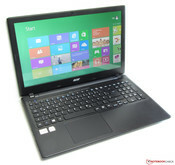 Acer's 15.6-inch Aspire V5-551-64454G50Makk is a slim and light notebook selling for less than 400 Euro (~$520). The power-efficient AMD A6-4455M APU should guarantee a long battery life. Find out here if the new notebook can deliver on that promise. Acer's lineup features many ultra-thin notebooks which evoke - at least as far as visual appearance is concerned - higher-priced Ultrabooks. The Aspire V5-551 is a new member of the family. 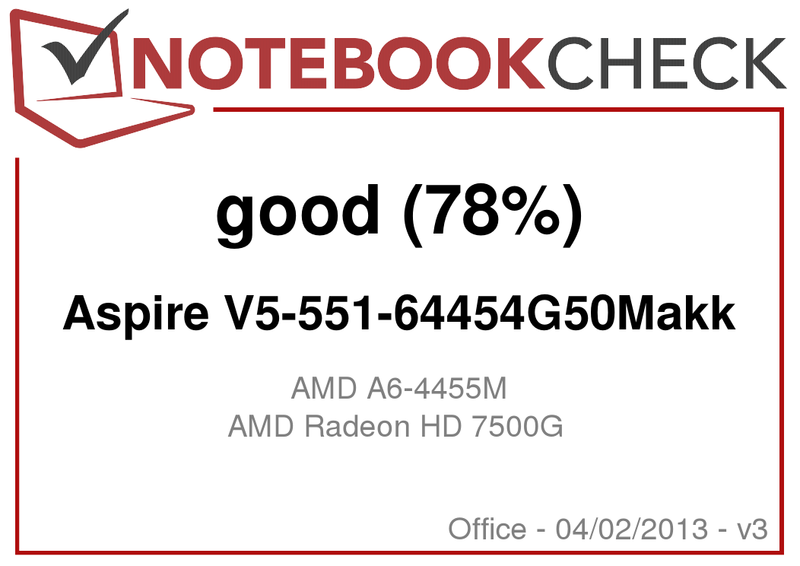 We already checked out the Aspire V5-531 (Pentium 967, HD Graphics) and the Aspire V5-571G (Core i5-3317U, GeForce GT 620M) in previous reviews. 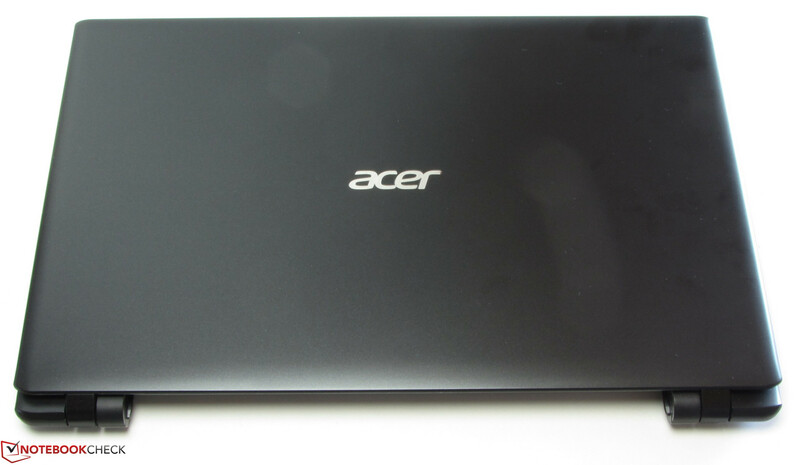 To see how the Acer's new entry stacks up, we compare it to the HP Pavilion Sleekbook 15 (AMD A8-4555M, Radeon HD 7600G) and the Acer Aspire V5-531 (Pentium 967, HD Graphics (Sandy Bridge). The chassis remains almost completely unchanged from the previous versions. The notebook is dressed in matte black - only the display is glossy. Higher-end materials (like aluminum) are nowhere to be found, since Acer uses plastic throughout. The Aspire V5-531 and the HP Sleekbook are no different in that aspect, however. 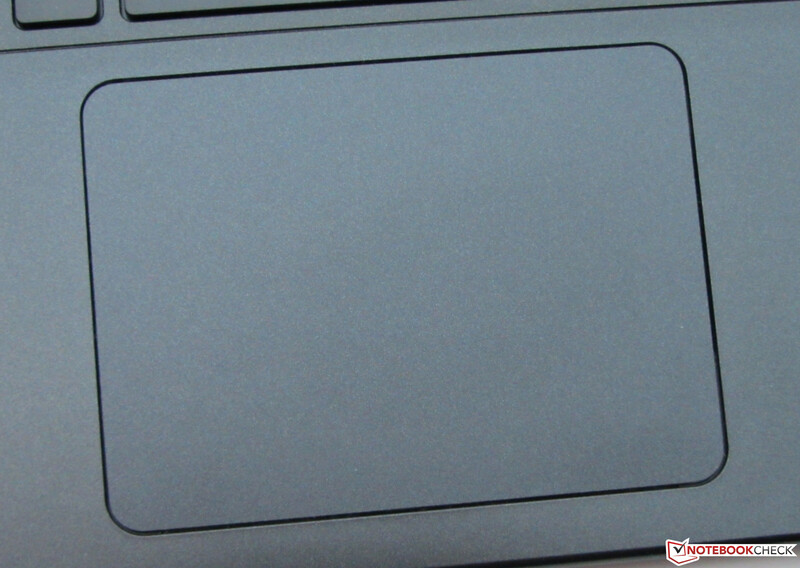 The base unit could be a bit more sturdy: we noticed a lot of flexing around the touchpad. Pressure to the left of the keyboard not only deforms the keyboard itself, but also causes the front right foot of the notebook to lift up from the supporting surface. The area to the right of the keyboard is also quite flexible - in this case, the culprit is the optical drive, which sits right underneath. The base unit is torsionally fairly rigid; the display lid unfortunately much less so. We also noticed ripple-effects when we exerted pressure on the back of the lid. The hinges are stiff and hold the lid well in position, although they can't prevent some back-and-forth bouncing. Because of the rather stiff hinges, both hands are needed to open the display lid. Matte black dominates the appearance. The chassis has no glossy parts. The modestly-sized single maintenance cover. All three notebooks are equipped with the standard ports we've come to expect in this segment of the market. The HP Sleekbook does not feature an optical drive and is limited to Fast Ethernet instead of Gigabit Ethernet. Although the V5-551 and the V5-531 are very similar, the way some of the ports are implemented differs: the V5-531 (and also the V5-571G) require the use of a dongle for both Ethernet and VGA; the V5-551 includes full-sized ports instead. In addition, the SD card reader is now on the other side. We are not particularly happy with the location of the ports, as they are mostly located towards the front half of the notebook on either side. 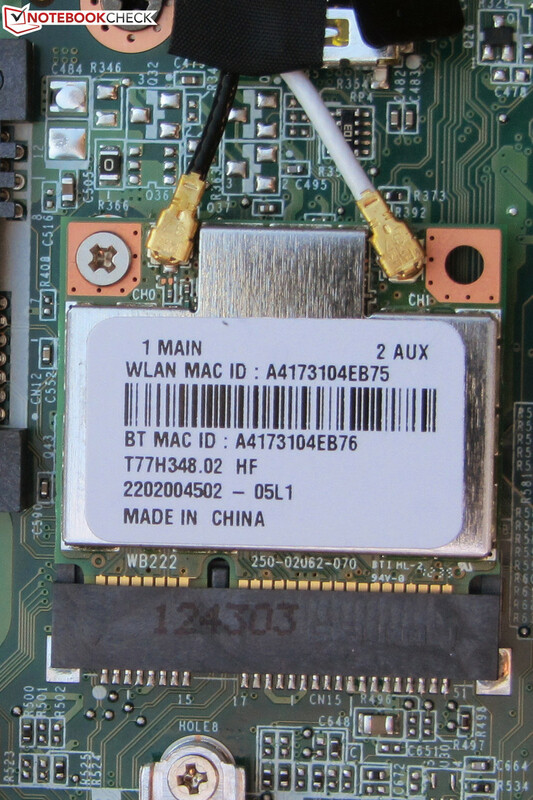 Acer uses a WLAN module from Atheros (AR5BWB222), which supports standards 802.11 b/g/n. Signal quality was never an issue: the Windows signal strength indicated reported five bars regardless if we were within 3 meters (10 feet) or two floors below the router (transmission strength about 50 percent). 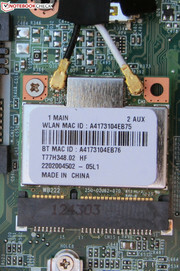 The Gigabit Ethernet and the Bluetooth 4.0 modules also from Atheros (AR8151). The integrated webcam (1280 x 720 pixels) delivers slightly noisy and not overly sharp images. 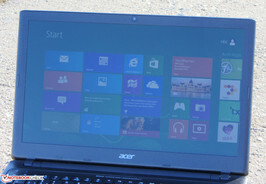 Acer includes a quickstart poster, a quickstart guide, and a pamphlet with warranty information. 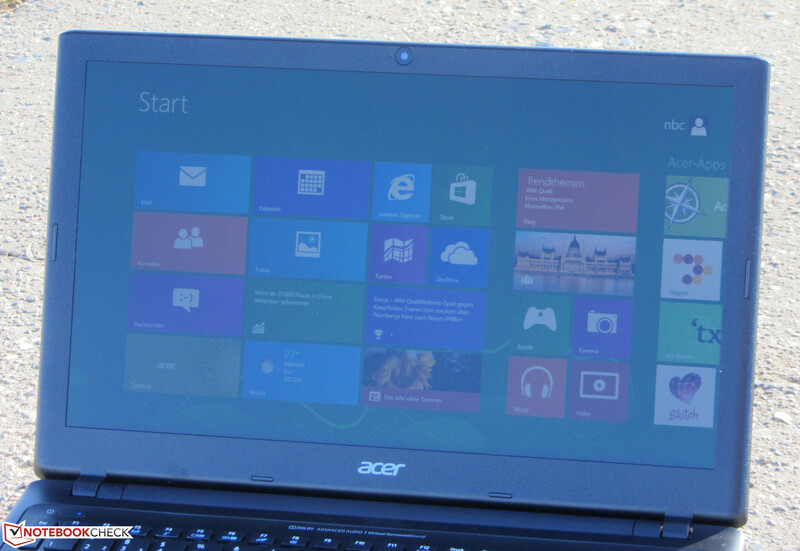 The Aspire V5-551 ships with Windows 8 (64 Bit) pre-installed. A system recovery DVD is not included. To recover the notebook, the user needs to press F8 during bootup to initiate a system restore. Downgrading the V5-551 to Windows 7 from native Windows 8 is not very complicated, even though Windows 7 does not have all the necessary drivers included (the WLAN and Gigabit Ethernet drivers are missing, for example). Since Acer only supports the V5-551 under Windows 8, we downloaded the drivers for the new OS - and had no problems using them under Windows 7. The driver for the APU can be found on AMD's website. The same is true for the chipset-driver, which is needed since it includes USB 3.0 support (otherwise, the USB 3.0 port can't be used under Windows 7). The maintenance and expansion options are fairly limited. 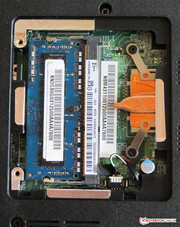 A small cover allows access to the single RAM slot, which is occupied by a 2 GB module. Another module with the same capacity is soldered onto the motherboard - the RAM operates in dual-channel mode. Theoretically the RAM could be expanded to 10 GB - but Acer warns that only up to 6 GB are supported. The only way to find out for sure is by trial and error. All the other components are only accessible if the notebook is disassembled further. 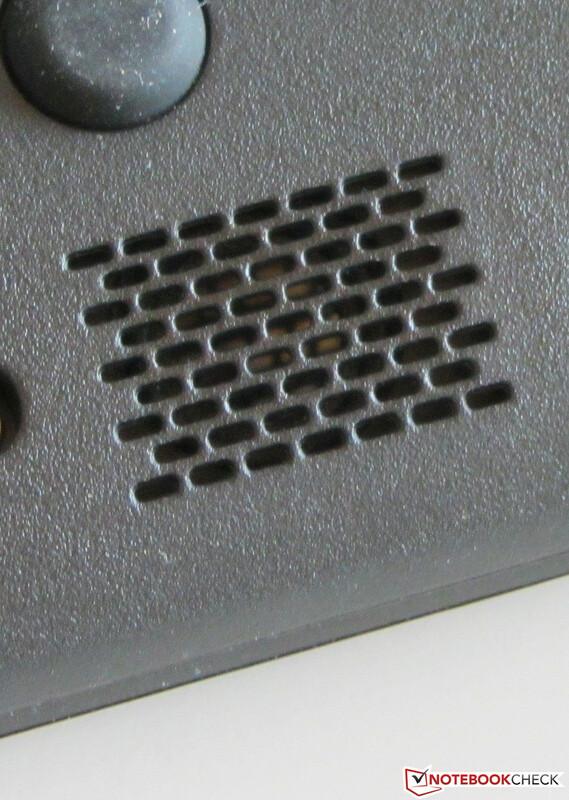 To disassemble the base unit, the maintenance cover needs to be taken off and the speaker cable needs to be disconnected, as the speakers are integrated into the bottom plate. After removal of the screws, the optical drive - which is secured by one of the screws that holds the bottom plate in place - can be pulled out. The two halves of the notebook can then be separated - we recommend using a plastic putty knife to avoid damage. 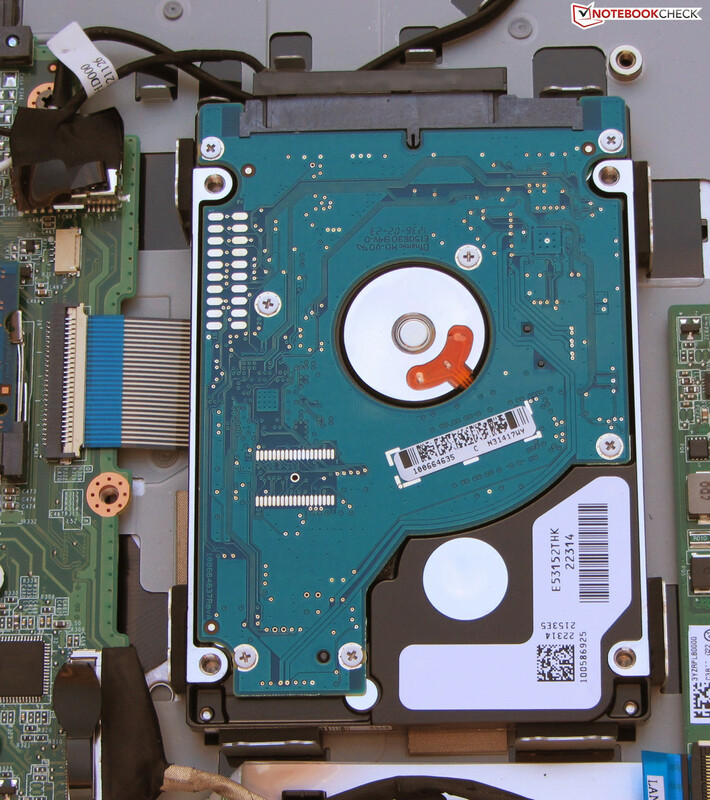 Flipping the notebook around and taking off the bottom half gives access to the inside and the other components, including the hard drive, which is not secured by screws. 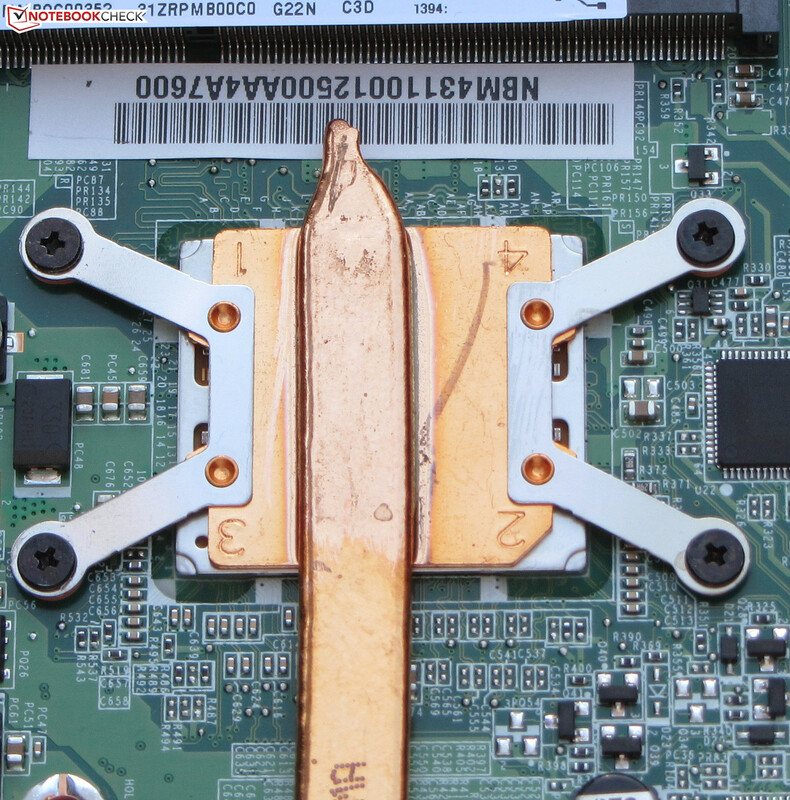 The hard drive in our review model is 9.5 mm thick, although a 7 mm version can also be used as a replacement. In Germany, both the Aspire V5-551 and the V5-531 are covered for 24 months against manufacturer's defects; the HP Sleekbook comes with a standard 12 month warranty. 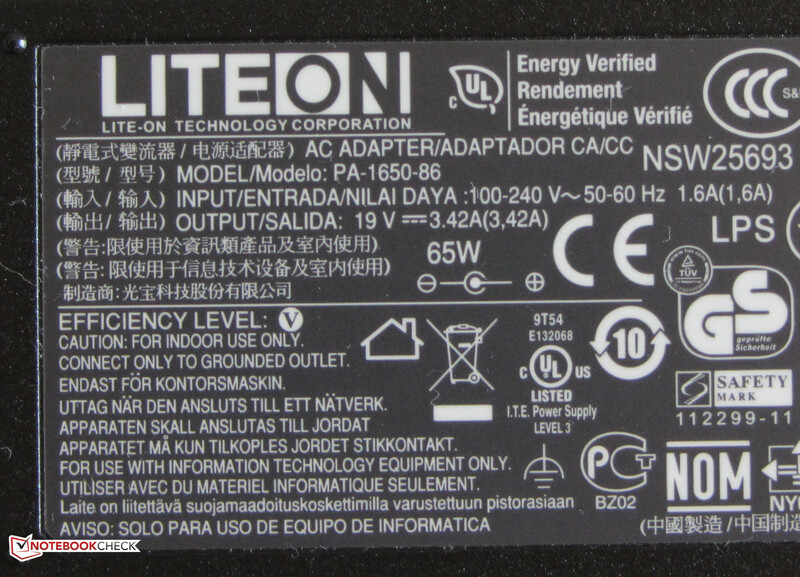 The warranty can be extended to three and four years for 70 to 80 Euro (~$90 to ~$105) and 120 to 180 Euro (~$160 to ~$240), respectively. The extensions need to be added within 365 days of the original purchase date. 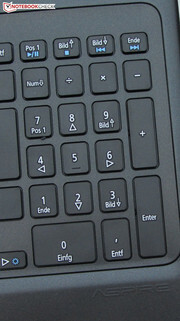 The chiclet-style keyboard features a number pad but no backlight. The main keys - which measure 15 x 15 mm (0.59 x 0.59 inches) - are smooth and flat; their click-point is well defined despite the shallow travel. The keyboard flexes a bit under pressure, although we didn't notice this flex at all while typing. Acer uses a multitouch enabled clickpad from Elan. 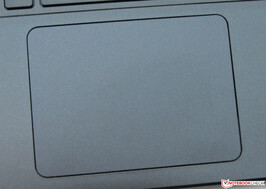 The touchpad measures 10.5 x 7.8 cm / 4.13 x 3.07 inches), features a smooth surface, and allows fingers to glide easily. Because of the large size, multitouch gestures - like two-finger zoom - are easy to execute. The individual gestures can be turned on and off in the configuration menu. 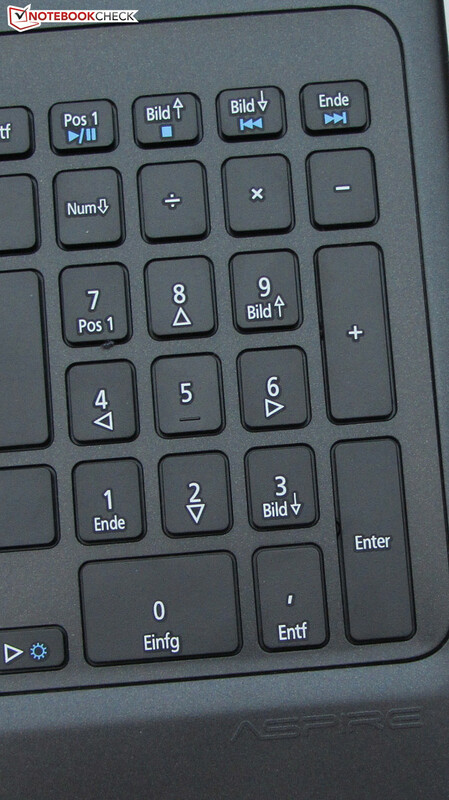 A clickpad doesn't feature separate mouse buttons - the whole surface is clickable instead. The pad recognizes the finger position and thus if the user clicked the left or right side. Travel is shallow, but the feedback is well defined and the clicks are audible as well. The keyboard does not offer a backlight. 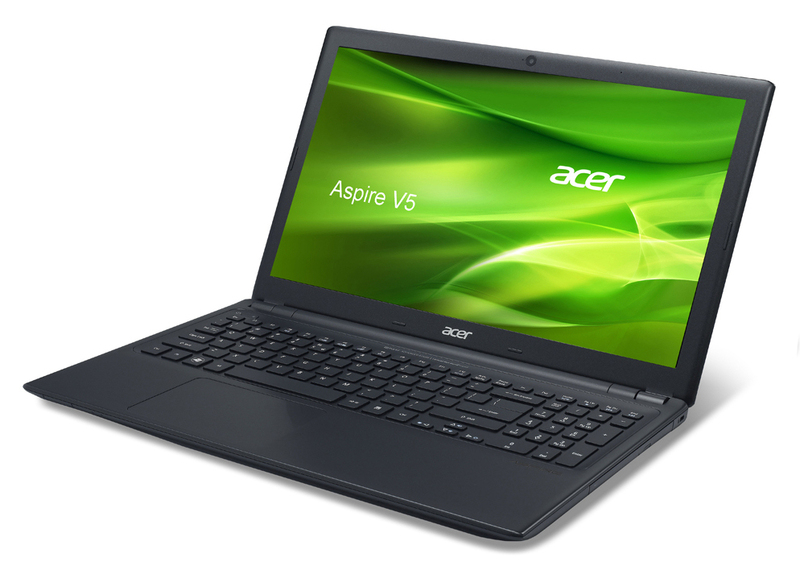 The Aspire V5-551 comes equipped with a glossy 15.6-inch display featuring a native resolution of 1366 x 768 pixels. Other display types are not offered. The average brightness of 192.7 cd/m² places the panel in the bottom half of the middle-tier in our database - although other systems have even dimmer panels: we measured 167.2 cd/m² for the HP Sleekbook and 176.6 cd/m² for the V5-531. After the not overly impressive brightness results, the contrast ratio (904:1) and black level (0.23 cd/m²) come as a real surprise - both values are excellent. In fact, the panels of many much more expensive notebooks can't keep up in this regard - and the displays of the V5-531 (196:1, 0.94 cd/m²) and the Sleekbook (196:1, 0.88 cd/m²) can't compare at all. 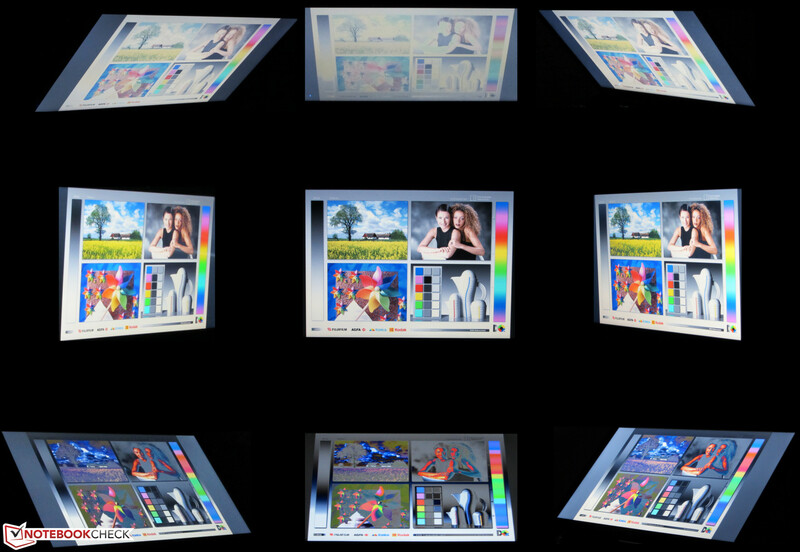 The gamut range of the panel does not cover the professional color spaces AdobeRGB and sRGB. As shipped, the display shows significant DeltaE 2000 deviations for the colors white, cyan, magenta, and for the gray levels. The deviation for blue (24) is very high, the other colors are not affected as much: the DeltaE falls between 5 and 10. The display output definitely suffers from a blue cast. Although the display is not really bright and glossy to boot, it's usable outside - thanks to the high contrast ratio. The viewing angle stability is in line with our expectations: deviating in the vertical plane leads to a decrease in picture quality quickly, horizontally the content of the screen remains decipherable up to almost 180 degrees - although the display darkens somewhat. 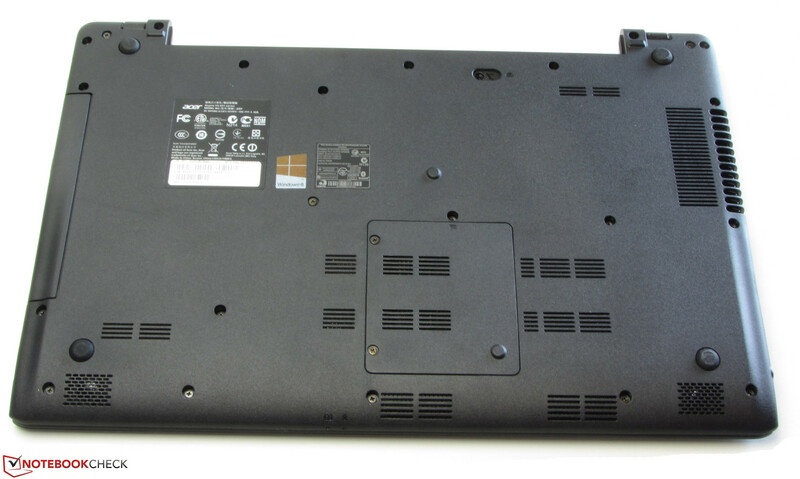 Viewing angles Acer Aspire V5-551-64454G50Makk. 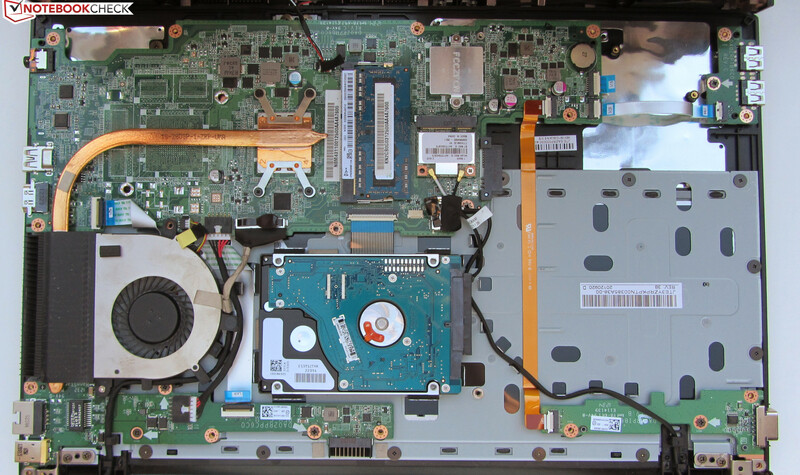 The Aspire V5-551 is a fairly simple business notebook based on an AMD APU. It's designed for the daily tasks like web surfing, communication, office-type work, and video playback. The performance is not really adequate for gaming, as we will see later. The street price of the Aspire V5-551-64454G50Makk is currently between 380 and 420 Euro (~$500 to ~$550). Other models in the V5-551 series have a different APU (AMD A8-4555M), hard drive, and/or RAM configurations. The price ranges from 400 to 500 Euro (~$520 to ~$650). There are also versions with a dedicated Radeon HD 7650M GPU. The Aspire V5-551 is equipped with a AMD A6-4455M Trinity APU. The CPU section has two cores running at 2.1 GHz - but up to 2.6 GHz are possible when the load increases (AMD Turbo Core). According to AMD, the TDP is 17 watts - same as Intel's ULV processors and the lower-performing E-series APUs. During the Cinebench single and multi tests, the CPU frequency remained mostly at 2.1 GHz, although one or the other core would spike to 2.3 or 2.6 GHz frequently. The V5 lags behind the Sleekbook (AMD A8-4555M, Radeon HD 7600G) in the multi-threaded tests - not surprising, since the HP notebook is equipped with a quad-core CPU. The V5 is faster during the single-threaded tests because of the higher core frequency of its CPU. The V5-531 (Pentium 967, HD Graphics) performs similar to the V5-551 running the single-threaded test, but outperforms it during the multi-threaded test. The Pentium processor in the V5-531 runs at 1.3 Ghz but nevertheless manages to deliver equal or better performance. The V5-551 edged out the two competitors when tasked with the Cinebench 11.5 GL test - but trailed them in the Cinebench 10 GL test. Compared to the E2-1800 APU found in the Lenovo B575e, the A6-4455M APU clearly delivers better CPU benchmarks. This is not really surprising, since the E2-1800 is clocked at a slower 1.7 GHz. 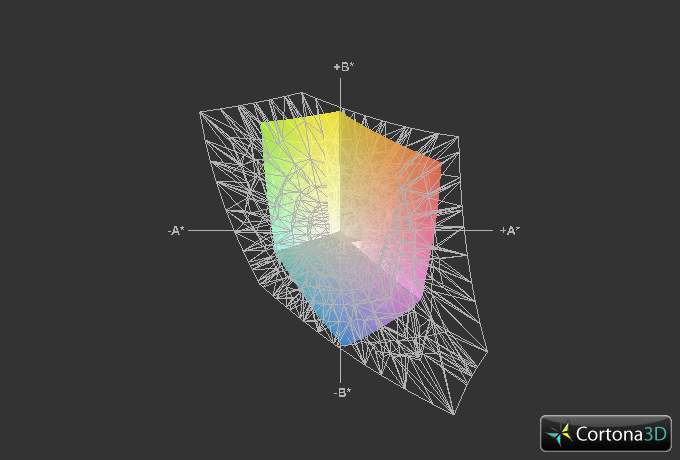 The V5-551 also delivers better results running the GL tests since its GPU is more powerful. During our time with the notebook, it became apparent that application starts are far from instantaneous. The culprit here is the very slow hard drive, which is also responsible for the pretty low scores the notebook achieved running the two PCMark benchmark tests: both trail the Sleekbook (AMD A8-4555M, Radeon HD 7600G) and the V5-531 (Pentium 967, HD Graphics). The results of the PC Mark 7 test are comparable to the Lenovo B575e (AMD E2-1800, Radeon HD 7340), which has a less powerful APU. Users interested in the V5-551 might consider swapping out the hard drive. We used an old Solid State Disk (a 32 GB Corsair Nova V32), installed Windows 7, and ran PCMark 7 again: we were rewarded with a speed increase of 61 percent (1931 points). On average, a SSD can better the PCMark scores by 30 percent - so the fact that we are dealing with a 61 percent increase shows just how slow the hard drive really is. 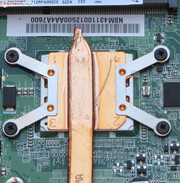 Acer uses a hard drive model from Seagate's Momentus 5400.6 series. The drive has a capacity of 500 GB and a rotational speed of 5400 RPM. The test results are far from impressive: CrystalDiskMark reports an average read speed of 69.1 MB/s; HD Tune 59.1 MB/s. Both results are quite unremarkable even for 5400 RPM drives. The Aspire V5-551 is equipped with an entry-level integrated Radeon HD 7500G GPU. The graphics card supports DirectX 11 and features a core clock speed of 327 MHz. AMD's Turbo Core can increase the clock speed to 424 MHz. The V5-551 outperformed the other systems when we ran the 3DMark benchmarks. This is surprising, since the Sleekbook (AMD A8-4555M, Radeon HD 7600G) has a slightly more powerful GPU with the same frequency, but more pipelines. 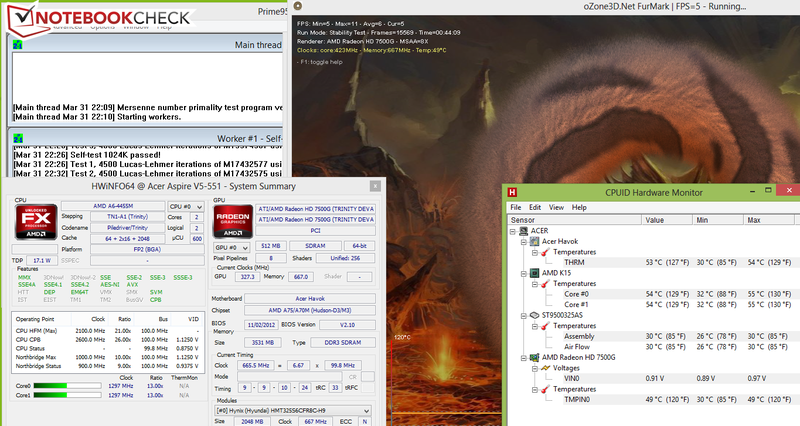 Both notebooks score similarly when running the 3DMark 11 test. Responsible for the better test results are probably the RAM installed in the V5-551 - it runs in dual-channel mode - and on the other hand throttling, which hampers the performance of the Sleekbook. The V5-531 (Pentium 967, HD Graphics) has the lowest-performing GPU and can't keep up with the competition. The gaming benchmarks confirm it: the V5-551 is not a notebook suitable for gaming - although the APU can handle some current games as long as the resolution (1024 x 768) and details are set to low. Those looking for an inexpensive, gaming-capable notebook should take a look at the Aspire E1-571G (Core i3-3110M, GeForce GT 620M) or the Packard Bell EasyNote TS11SB-250GE (AMD A8-3520M, Radeon HD 6620G + Radeon HD 7670M). Both notebooks have no issues playing most current games - and they sell for less than 500 Euro (~$650). The fan of the V5-551 is on at all times and always audible. Working with the notebook thus gets annoying fairly quickly. We measured 33.7 - 36.2 dB during idle - both the Sleekbook (32.3 - 32.9 dB) and the V5-531 (31.9 - 34 dB) are less obtrusive. Subjected to medium (3DMark 06 is running) and high load levels (stress test - Prime95 and Furmark running in parallel), the noise level increases to between 38.2 and 41.9 dB. Both the Sleekbook (37.3 - 41.7 dB) and the V5-531 (36.4 - 40.1 dB) are equally noisy. The Aspire V5-551 during the stress test. During idle, the chassis of the Aspire never exceeds 30 degrees Celsius (86 degrees Fahrenheit). Under load, temperatures increase to between 24.9 and 40 degrees Celsius (76.82 to 104 degrees Fahrenheit). Both the Sleekbook and the V5-531 get warmer during idle - but the temperatures are still acceptable. Under load, the V5-531 gets warmer than the V5-551, the Sleekbook stays a bit cooler. During the stress test (Prime 95 and Furmark running in parallel for at least one hour), the CPU speed is not consistent : we saw fairly substantial frequency fluctuations for both cores from 900 MHz to 2.6 GHz. After about 10 minutes, the frequency settled around 1.3 GHz - although we could still observe spikes in either direction. The maximum frequency at this point was 2.3 GHz. At the beginning of the stress test, the GPU achieved its Turbo-induced maximum of 424 MHz. After a few minutes, we saw drops down to 327 MHz, after 10 minutes the GPU stayed at that speed for good - save for the occasional spike back up to 424 MHz. After about 25 minutes, we saw occasional drops to 200 MHz. When we repeated the stress test while the notebook was running on battery power, the CPU ran at 2.1 GHz, while the GPU remained at 327 MHz. Following the stress test - with the notebook plugged in - we repeated the 3DMark 06 benchmark: the resulting score of 3714 points (CPU: 984 points) is lower than what we saw after a cold start. Although it appears that the notebook might be hampered by throttling in high-load scenarios, we don't think that it is really any issue, as the results of the tests and benchmarks overall are right where we would expect them to be. The CPU temperature leveled off at 54 degrees Celsius (129.2 degrees Fahrenheit) with the notebook connected to external power. (+) The maximum temperature on the upper side is 37.7 °C / 100 F, compared to the average of 33.9 °C / 93 F, ranging from 21.2 to 62.5 °C for the class Office. (±) The palmrests and touchpad can get very hot to the touch with a maximum of 37.7 °C / 99.9 F.
(-) The average temperature of the palmrest area of similar devices was 28.2 °C / 82.8 F (-9.5 °C / -17.1 F). 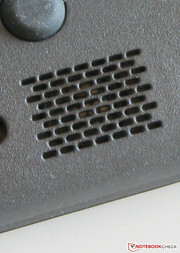 The stereo speakers of the V5-551 are located on the bottom. They definitely lack base and also sound rather tinny. The pre-installed Dolby Advanced Audio software does improve overall sound quality - but we still strongly recommend headphones or external speakers if premium sound is required. During idle, we measured a power consumption of between 8.3 and 11.5 watts. The V5-531 needs even less - 8 to 10.5 watts. Under medium load (3D Mark 2006) and high load scenarios (Prime95 and Furmark) the V5-531 (28.4 to 33.9 watts) is again more frugal than the V5-551 (32.6 to 38.9 watts). To check the battery life in idle mode, we use the Battery Eater Reader's test: the display brightness is turned all the way down, the power saver profile enabled, and the wireless modules turned off. 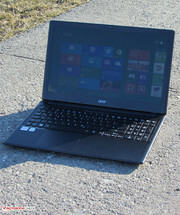 The Aspire V5-551 lasted 5 hours 26 minutes - ahead of the Sleekbook (5 hours even) and the V5-531 (5 hours 9 minutes). To determine the battery life under load, we run the Battery Eater Classic test with the screen set to maximum brightness, performance profile enabled, and wireless modules all turned on. The notebook shut down after 1 hour 18 minutes. This time around, the V5-551 lags slightly behind the competition - the HP lasted 1 hour 27 minutes, the V5-531 1 hour 36 minutes. 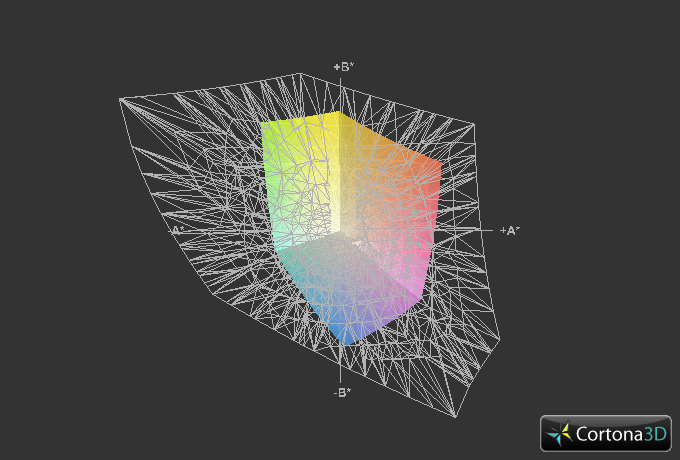 For our WLAN test, we set the screen brightness to 150 cd/m² and enable the power saver profile. A script then visits various webpages every 40 seconds. After 3 hours 19 minutes, we had to plug the notebook back in (HP: 3 hours 20 minutes, V5-531: 3 hours 24 minutes). The notebook was able to play back DVDs for 2 hours 34 minutes - enough for very long movies. The V5-531 (2 hours 39 minutes) lasts slightly longer, however. For that test, we set the display to its maximum brightness, deactivate wireless, and use the power saver profile - unless the playback is not smooth enough, in which case we choose a higher profile. 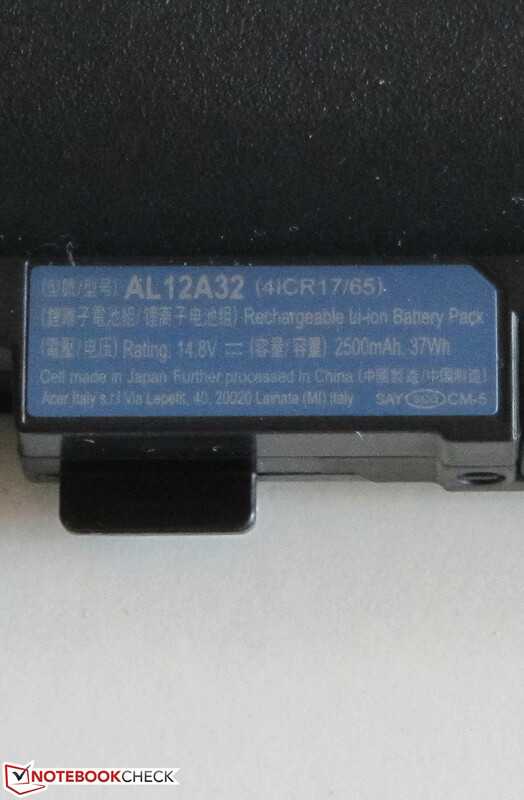 All three notebooks in our comparison have a battery with a capacity of 37 Wh. The Acer Aspire V5-551 features a display with a very high contrast ratio in a slim chassis and is protected by a 24-month warranty. 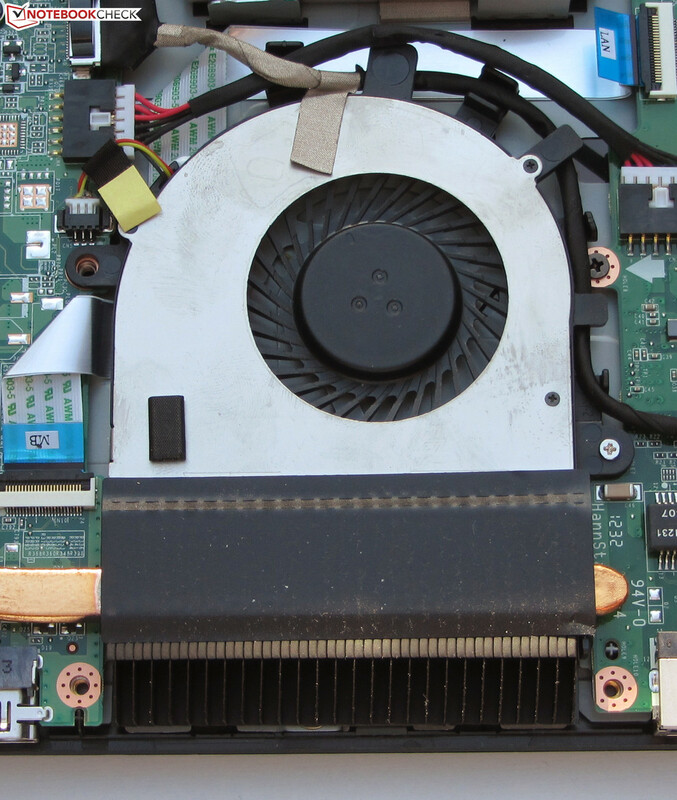 The overall impression is marred by a very sluggish hard drive and an overly annoying fan. Performance also suffers because of the slow hard drive. 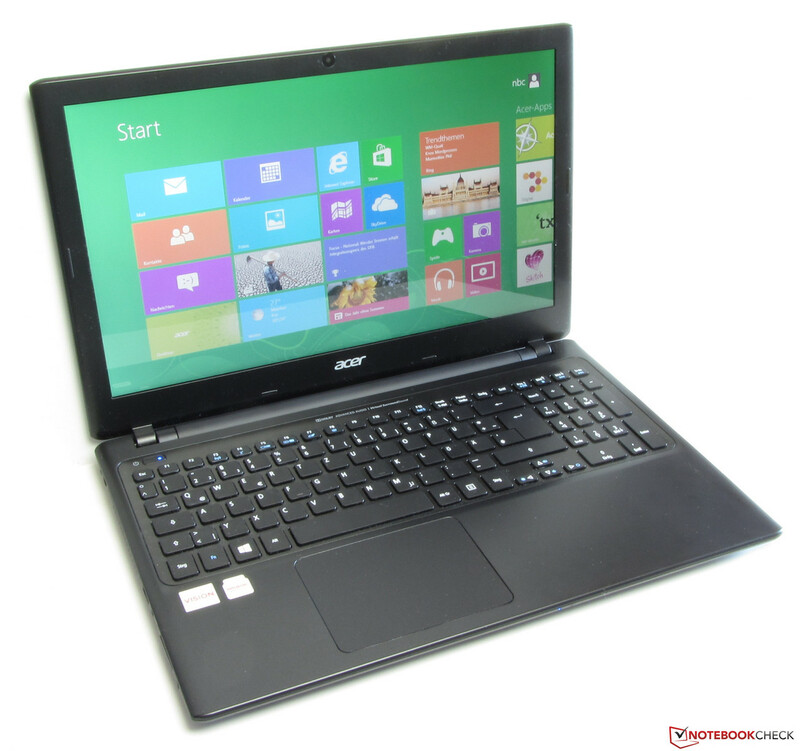 Users requiring a system with a more powerful CPU should take a look at the Aspire V5-531. We don't really see a reason to recommend the HP Pavilion Sleekbook 15 above the V5-551 - it's more expensive, has no optical drive, and no Gigabit Ethernet. Battery life is also not any better. 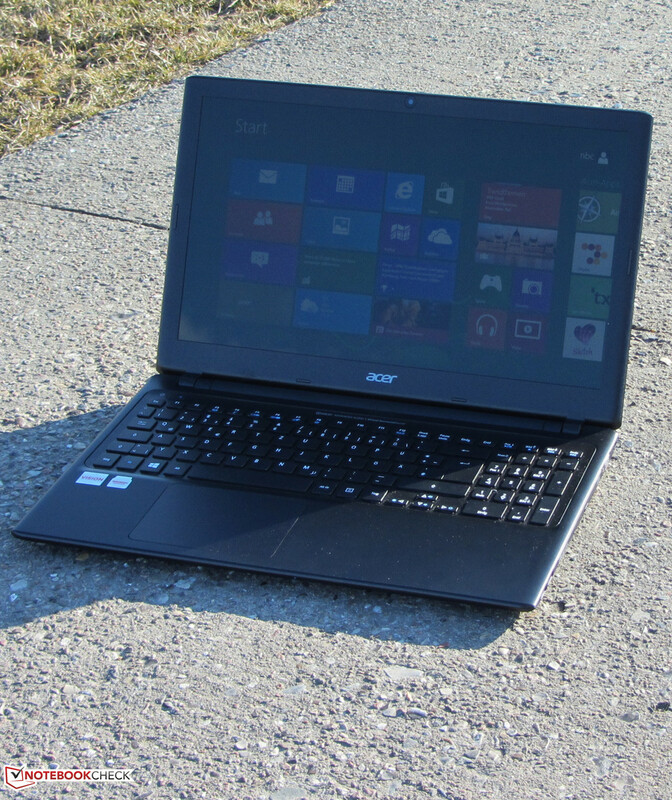 Compared to the Sleekbook, the Aspire V5-551 simply offers more for the money. 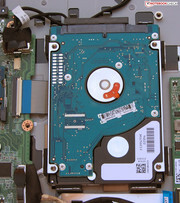 The DVD-RW drive reads and writes all formats. The speakers are located on the bottom. 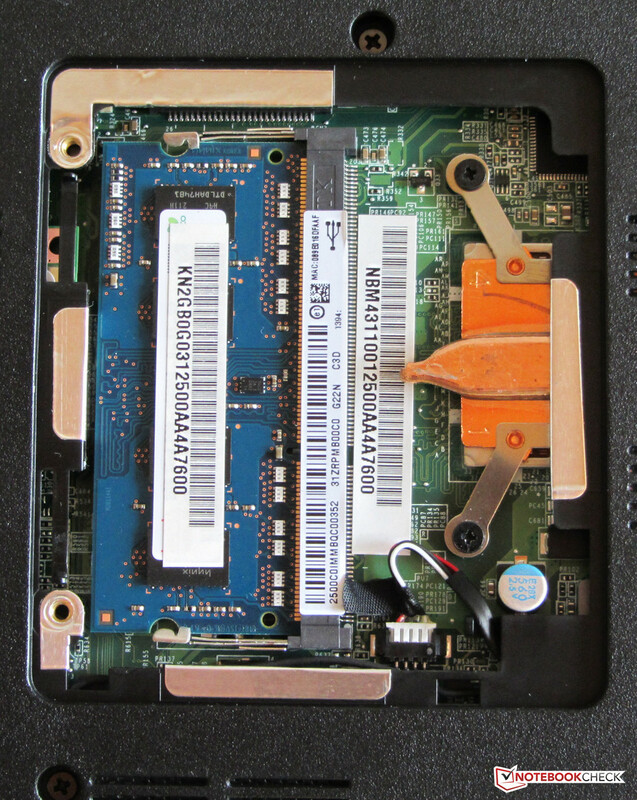 One RAM slot is available. The APU is soldered onto the motherboard. 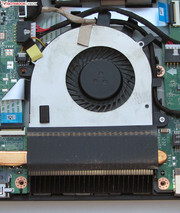 The cooling fan is accessible for cleaning purposes. The hard drive can be swapped out. ...and has a capacity of 37 Wh. ...and is rated at 65 watts. The high contrast ratio and the 24-month warranty. The notebook is in desperate need of a faster hard drive. We would also appreciate a less obtrusive cooling fan. 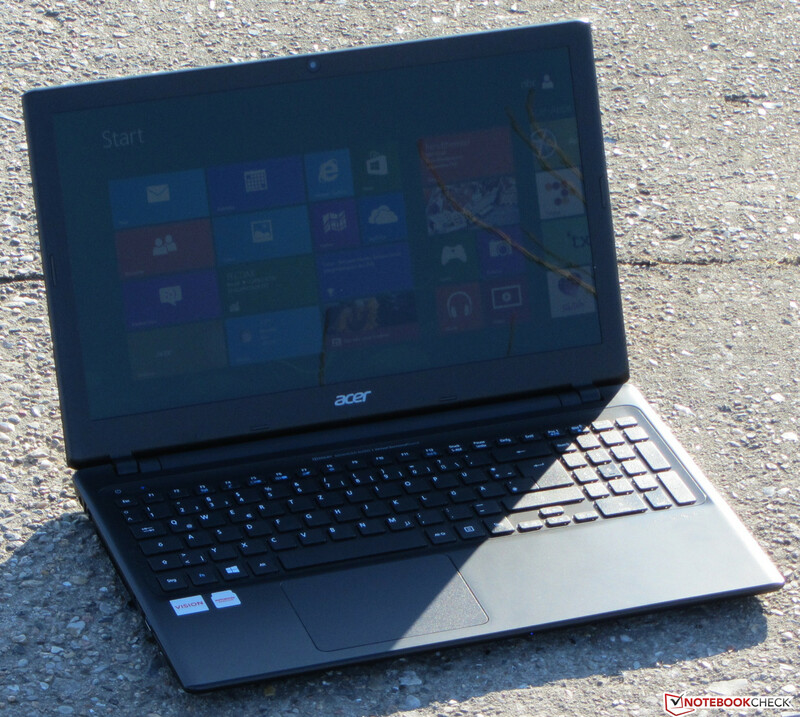 Acer delivers a bargain notebook - and outfits it with a display with outstanding contrast ratio. Many more expensive notebooks have lower quality screens.